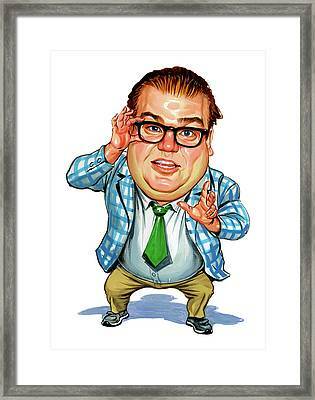 Chris Farley As Matt Foley is a painting by Art which was uploaded on February 6th, 2012. Matt Foley was a fictional motivational speaker from the sketch comedy program Saturday Night Live performed by the late Chris Farley. The character was created by Bob Odenkirk. 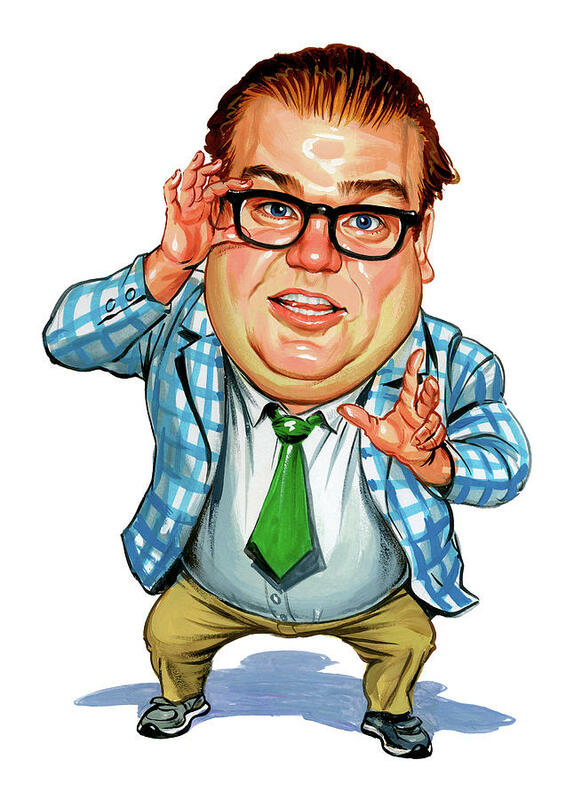 Farley had performed the character in other comedy groups before being a cast member on Saturday Night Live. Essentially, Foley is the antithesis of a good motivational speaker: abrasive, clumsy, and down on his luck. Farley named the character after one of his Marquette University rugby union team-mates of the same name who is currently in the US Army as a Roman Catholic Chaplain. The character was moderately popular in its time and is now considered some of Farley's best work and one of his best characters. 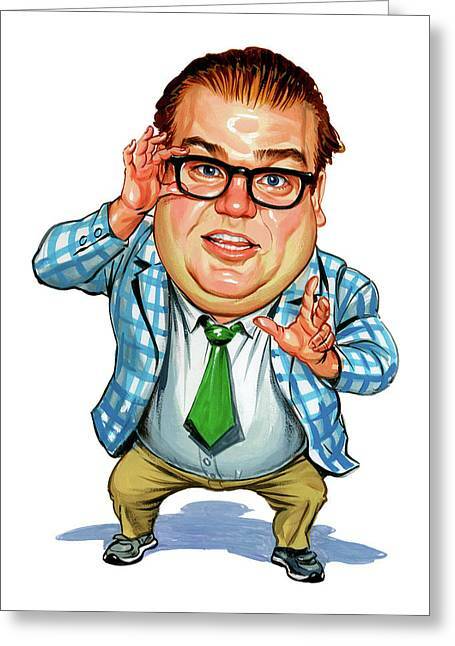 Plans for a film version with David Spade in a supporting role were interrupted by Farley's unexpected death in 1997. Foley appears in eight Saturday Night Live sketches. Each sketch usually starts with Foley being brought into a specific situation by someone to speak to a group. In addition to appearing dishevelled, overweight, and unstylish, he yells, disparages, displays cynicism, and unintentionally gives a negative motivational message. Foley's trademark line is warning his audience that, like him, they could end up being "...35 years old, thrice divorced, and living in a van down by the river!" In most sketches, whenever a member of his audience responds with some statement of accomplishment, Foley responds with, "Well, la-dee-frickin-da! ", "Whoop-deefrickin-doo! ", " Dad - I think you should shut your big yapper!" or a similar remark. The sketches often include Foley giving wildly exaggerated gestures and falling (or jumping) onto a piece of furniture, destroying it while sometimes injuring himself in the process. In the character's SNL debut, David Spade and Christina Applegate, who were playing the teens supposedly in need of Foley's help, had to cover their own laughter. Spade in particular spent most of the sketch with his hand over his mouth. At the end of each sketch, he is usually quickly herded out of his speaking location, where the people left behind huddle together and comment on him, usually bemused and fearful. Though his speeches always backfire, the end results are usually successful, in that the recipients do not want to be associated with Foley. One departure sketch had George Foreman considering the fact he was too old and weak to continue boxing, and happens to walk by the river, where he comes upon Foley's van. Foley does not go into his usual tirades, instead ordering Foreman to do all sorts of chores such as barbecue hamburgers, claiming the work is "for dexterity"! When Foreman realizes Foley is using him, he punches Foley, causing Foreman to realize he can still fight and ultimately goes on to win the championship. Foreman then recites this to Tim Meadows, who wonders why is he is cooking burgers for George, who barks, "You know why! For dexterity!" Well done! So lifelike, lol! Congrats on your sale! 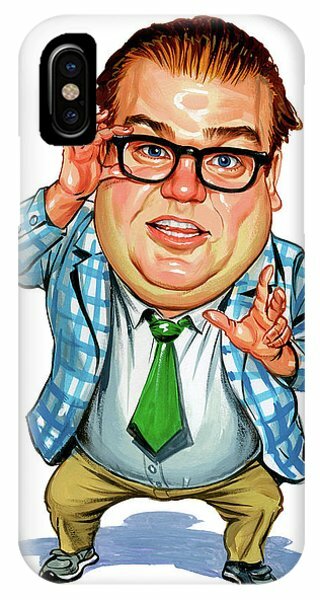 Hopefully NOT In a Van down by the river! Congrats! Love it! I actually used the phrase "I live in a van by the river!!!" the other day - great character. Congrats on the sale! Great work! An image that will capture the eyes of everyone who knew of him! Another fantastic piece! Congratulations on your sale!